FlyCircuit is capable of displaying combinatory images through different modalities. In addition to processing images in batches, Archive allows users to upload their own image data that can then be transformed and standardized for comparison, analysis and prediction of its pre- and post-synatpic targets. Once the neurons of interest are selected, Collocate funnels image entries into either AVIZO or NCHC Viewer for interactive 3D visualization. 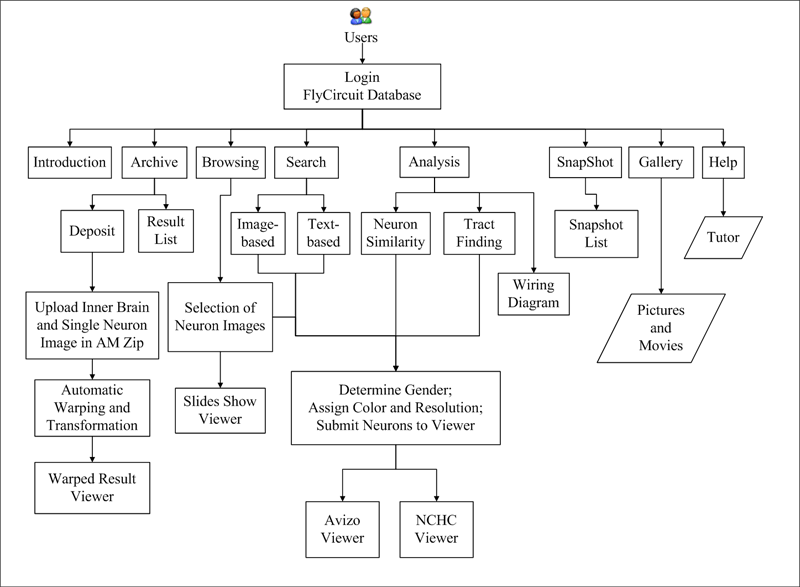 NCHC Viewer, developed specifically for FlyCircuit, runs faster and has fewer limits in the number of simultaneous online users. Search provides a set of informatics tools. Analysis allows generation of neural tracts (inter-regional connections) and predicts neuron-to-neuron connections. SnapShot records images and movies and keeps them in a private storage space, designed to store the generated images as well as the uploaded original data by every individual registered user. Gallery displays examples of pictures and animations. Help provides a step-by-step tutorial for beginners.